Home Office statistics published last week show British universities, companies, government bodies and charities completed 3.87 million tests involving 3.8 million living animals in 2014, including horses, dogs, cats, monkeys and cattle. Crucially, these figures don’t reveal how many additional animals were bred for experiments but later rejected from trials - we may never know the true number of animals bred and kept for testing in the UK. Accurate interpretation of the cost for animals used in tests remains hidden. The UK Government’s own report, based on laboratory data following new European requirements for information, admits that reporting is inaccurate and incomplete. The report also expresses doubt that full data is shared, including the number of tests that take place without anaesthetic. UK laboratories regularly refer to the UK policy of replacing, refining and reducing (3Rs) the use of animals in experiments, but cleverly avoid acknowledging the total absence of any progress towards these goals. Claims for the replacement, refinement and reduction of the use of animals are not only hollow but also misleading. The statistics on animal use covering 2014 indicate a reduction in the total number of experiments of around 7% for that year. However, a change in the reporting of data from experiments underway to experiments completed means that there is likely to have been no reduction at all. This has not stopped pro-animal testing campaigns, such as Understanding Animal Research, from congratulating the industry on a statistical improvement. In fact, even Home Office Minister Lord Bates congratulated the science community on the result, while promoting the new policy ban on testing household products on animals, due to apply from November 1st this year. Lord Bates failed to mention however the exclusion in the ban which enables animal testing to continue for the ingredients of those products, which effectively removes any likelihood of the ban improving animal welfare in the sector. 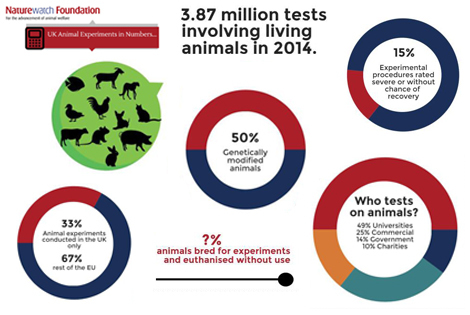 More than a third of European tests involving live animals take place in the UK. Many animals bred for experiments don't meet the requirements for inclusion in a trial and are euthanised, with the result that the true number of animals will remain unknown. The UK Government promised a review of the secrecy clause which currently prevents public access to information on animal experiments. It has yet to respond to its own public consultation, which closed in June 2014! Investment in technology which can replace animals in experiments currently stands at £8 million in 2014. However funding for the research councils which develop animal-based tests ran to £300 million. WHAT IS NATUREWATCH FOUNDATION DOING? We’re publishing a series of guides to the truth behind the most recent statistics on animal experiments in the UK. Our first illustration of the true picture is included here, but we will also be publishing on social media where you will be able to find and share this graphic as well as the posts we’ll add in the near future. This isn’t the only way to get involved with addressing Britain’s tradition of animal cruelty in laboratories – you can quickly and easily affect demand by choosing cruelty-free products with our Compassionate Shopping Guide. You can also help as part of our Voluntary Action Network by contacting Naturewatch Foundation. We’ll send you our introductory pack, supported by monthly bulletins, full of practical activities for anyone interested in safeguarding animal welfare.